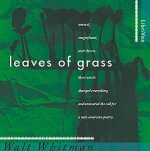 American poet Walt Whitman’s Leaves of Grass, is a collection of poems notable for its frank delight in and praise of the senses, during a time when such candid displays were considered immoral. Where much previous poetry, especially English, relied on symbolism, allegory, and meditation on the religious and spiritual, Leaves of Grass exalted the body and the material world. Whitman was inspired to begin Leaves of Grass after reading an essay by Ralph Waldo Emerson which expressed a need for a uniquely American poet. When the book was first published, Whitman sent a copy to Emerson, whose praiseful letter of response helped launch the book to success. Whitman’s hero, Abraham Lincoln, read and enjoyed an early version of Leaves of Grass. Despite such high recommendations, Whitman faced charges of obscenity and immorality for his work, but this only led to increased popularity of the book. Everyone must listen to this before they can no longer listen.